Constructed Comfort is a two-person exhibition with Carrie Gillen at the M.G. Nelson Gallery at the SAA. Artist talk by Jessica Bingham for the Illinois Art League Members’ Meeting. Jessica Bingham is a curator and artist based in Peoria, IL. She is the Curator of Art II at University Galleries of Illinois State University and since 2015 has co-operated Project 1612, a short-term residency and independent artist-run space in the garage at her home. Jessica is a multidisciplinary artist exploring childhood nostalgia, loss, home, and now, motherhood; these themes are implemented in various for­­ms including painting, found-object assemblages, and interactive installations. During her visit, she will discuss curating, both independently and institutionally, navigating studio time as a new mother, and how the age-old Golden Rule applies to her practice. This is an invitational exhibition featuring collaborative works by pairs of artists, friends, and family. Jaci Musec and I will have a piece in this exhibition. Project 1612 co-founders, Jessica Bingham and Alexander Martin, will be presenting at ArtsPartners The Business of Art conference on Saturday, February 9th at 10am. Their session, ‘Calls, Proposals, & Exhibitions,’ will cover exhibition applications, proposals, and where to look and apply for calls for artists. They will also discuss install etiquette and how to professionally prepare for group and solo exhibitions. The Business of Art is a one-day event designed to connect entrepreneurial artists with business professionals who can help them navigate the world of business. Through seminars and networking, The Business of Art will assist artists of all disciplines with establishing or enhancing their businesses. A full list of sessions and registration for the conference can be found here. Exhibition review for the Bradley University MA Exhibition. This review is part of Sixty Inches From Center’s Sixty Regional, a project that partners with artists, writers, and artist-run spaces highlighting art happening throughout the Midwest and Illinois. Show runs until September 8th, 2018 with a Gallery Talk on Tuesday, August 7th (begins at 6:00pm). 'Real Talk' is an ongoing series that offers a look into the lives of art professionals working outside of New York and Los Angeles. Read Jessica's 'Real Talk' here. I will be presenting on Project 1612, alongside co-founder Alexander Martin, at Beyond Alternatives, an inaugural 2-day symposium in Champaign, IL organized by Dulcee Boehm and Cory Imig. This symposium will focus on artist-led organizing outside of large metropolitan areas. More information on the symposium and other speakers can be found here. A recent interview with Barry McNamara of Monmouth College discussing my undergraduate studies and current work as artist and curator. The article can be found here. Article about the exhibition can be found here. 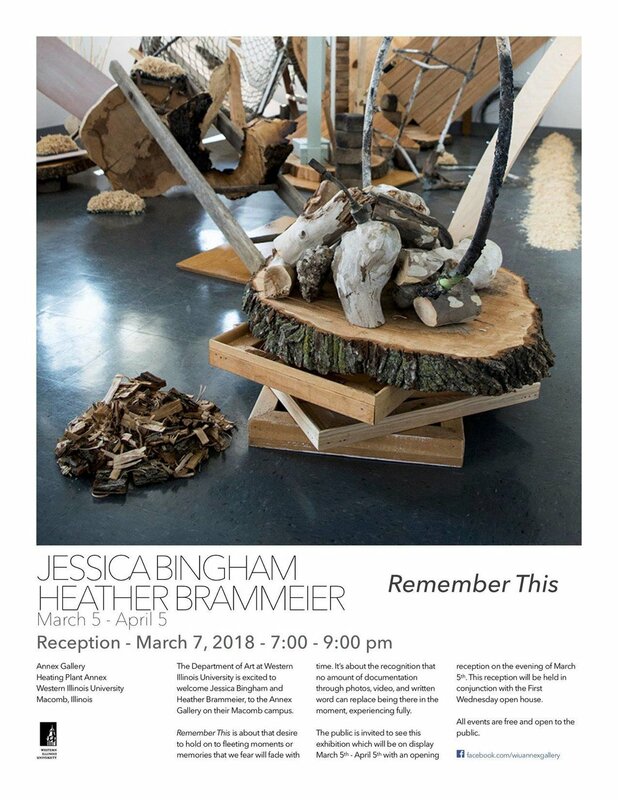 This is a two-person exhibition with Heather Brammeier. 'Process: what it was when it wasn't', the current group exhibition at The Overlook Place, is listed on Bad at Sports Top V. Weekend Picks. Studio visit and interview with Pleat Gallery. Read the full interview at pleatgallery.com. "I’d say my work is visually childlike and playful, but has dark undertones about loss, addiction, and nostalgia for childhood. I usually work either in painting or installation and my art is informed by cemeteries I have visited or the neighborhood I grew up in. My paintings are abstracted observations of those visits, focused on the layout of the cemetery, tombstones I found interesting, and the piles of flowers, candles, balloons, letters, and dirt that are on plots or in recycling bins. My installations tend to reference those visits more literally with mounds of dirt, flowers, grass, and even tents and childhood games like hopscotch." Two-person online exhibition with Falon Mihalic on Pleat Gallery. Silver Linings is a group exhibition. Through the Studio Break Pro Competition 2017, I will have a solo exhibition at Heartbreaker in Peoria, IL and be interviewed on Studio Break. Dates and times TBD. Susie Magazine is a bi-annual creative print publication that presents cutting edge work highlighting & empowering women, trans & non-binary voices. My recent interview for Expose Art Magazine with Erin Hayden and Jon Henry about the use of glitter in their work. The Terrain Biennial is an international exhibition of site-specific art made for front yards, balconies, and porches centered in the historic village of Oak Park, IL. This year, the Enos Park neighborhood in Springfield, Illinois will serve as an outpost site for the 3rd Terrain Biennial and will feature seventeen sites throughout the neighborhood. The 3rd Terrain Biennial at Enos Park will launch with a preview night on Saturday, September 30th. On the eve of the official start of the 2017 Terrain Biennial, curators, artists, property owners and community members are invited to gather in Enos Park to tour the sites between from 5:00 – 8:00 PM. An after party will follow at the Springfield Art Association. The Terrain Biennial in Enos Park is organized by Allison Lacher and Jeff Robinson. A map of all Terrain Biennial locations and the dates of the openings for each neighborhood will be posted to www.terrainexhibitions.com. The 3rd Terrain biennial at Enos Park will run through November 15th. Founded in October of 2011 by artist Sabina Ott and author John Paulett, Terrain Exhibitions and The Terrain Biennial repurposes private spaces such as front yards, porches, or windows, turning them into public spaces in order to foster dialogue between neighbors and provide opportunities for artists and viewers alike to experience new perspectives. The projects at the 3rd Terrain Biennial will range from sculptural installations to time-based performances to public interventions. A recent interview with Abby Gettys of Collecture . I discuss my artwork, studio practice, Project 1612, and what I have been collecting lately.